We’ve all heard that the kitchen is the heart of the home, and Harrell Remodeling’s award-winning Senior Designer, Gloria Carlson, agrees. The kitchen being her favorite room to remodel, Gloria has helped many of her clients reimagine their kitchens, making the spaces not only beautiful and functional, but also creating a place for entertaining friends and family. Understanding a client’s entertainment style is paramount to producing a finished product that fits their unique lifestyle and preferences. “Everyone entertains in different ways,” explains Gloria, who is a Certified Kitchen Designer (CKD). There are a few key questions Gloria asks when meeting with clients who want to redesign their kitchens. Gloria delves into the following areas that guide her toward an end result that best fits the way they live and entertain. This includes how the homeowners interact in the kitchen. Does one person cook everything and then clean? Does one person prep while the other cleans? Will two or more people be cooking together? When the homeowners entertain, how many people typically come to a gathering? How do they want to interact with their guests? Do they need flexible seating space for both intimate and large groups? According to Gloria, some people are what she calls “participatory entertainers,” meaning they love having gatherings where friends and family are involved in the preparation of the meal. This entails designing the kitchen to provide plenty of workspace for meal prep and clean up, as well as ensuring there is adequate room for people to move freely throughout the kitchen. 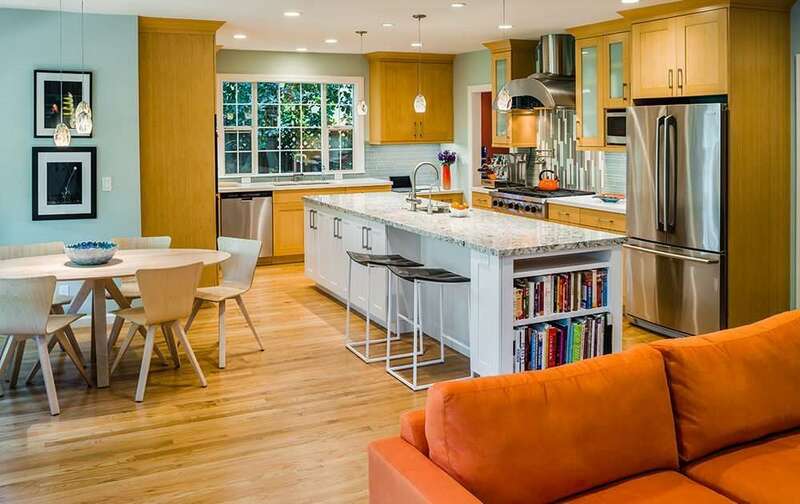 Often a spacious island is part of this type of entertaining kitchen remodel. Other people prefer to cook alone but want to have an inclusionary yet distinct gathering area that allows guests and host to interact while the food is being prepared. Sometimes they simply want seating nearby for easy conversations with guests, and sometimes they are looking for something more specific. “We had a client who loved soda fountain drinks,” Gloria said. “Using this theme, we created a separate bar area and serve-yourself beverage center with a soda bar gun, ice maker, and vintage bottle cap backsplash that was a big conversation piece.” This custom entertainment space connected to the kitchen, creating the ideal blend of separation and interaction, enabling the host to cook in peace yet entertain and converse with their guests. Still others want their kitchen to be a showpiece, a beautiful place to gather and entertain, yet they don’t plan to use it for cooking. These spaces take ambiance, flow of people, and ample seating into consideration. Of course, they are also functional and well thought out, even if they are only used to entertain. Gloria also finds many clients hold gatherings that revolve around sports. Having a television in the kitchen area or nearby with an area for guests to eat and watch the game is key. Other homeowners want flexible spaces where they can add or remove tables and seating based on the size of the group they are hosting. No two kitchens are ever alike. Each kitchen Gloria creates is custom, unique to the people for whom she is creating it. “Designing a kitchen for entertaining and fun is very much an individual endeavor,” she says. Each kitchen is distinct, centering on the homeowner’s personalities, lifestyle, hobbies, personal design aesthetic, and cooking/entertaining style. She believes that any combination of homeowner and designer will create a completely different design within the same space, yet the end result can be beautiful, functional and solve the problems of their previous kitchen. Many clients would love an island in their kitchens, but she cautions that an island must fit the space. Squeezing in an island can result in a cramped, less functional. and desirable layout. Whatever socializing style fits you, there is a kitchen that will fulfill how you live, cook, and entertain. 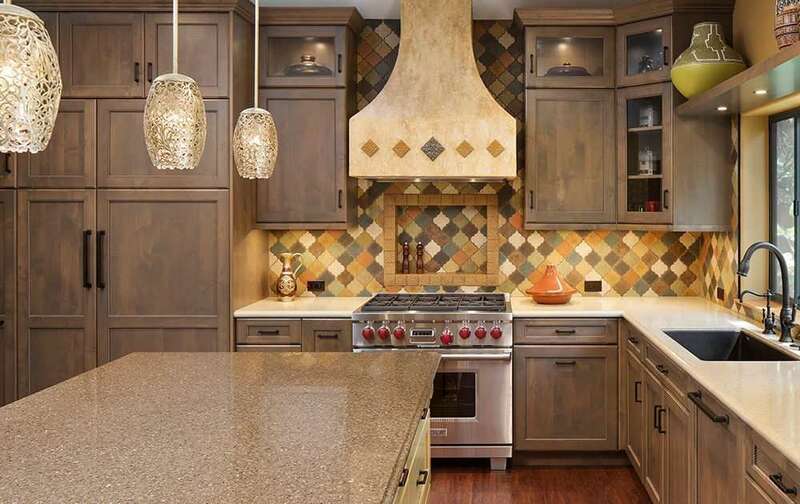 Harrell Remodeling Design+Build and premier designer, Gloria Carlson, can help your kitchen entertaining dreams become a reality.